Edward's Animals is a tender, charming funny novella of modern romance. Edward is a pansexual Manhattanite who is so morbidly shy he cannot see people as people. He loves the males and females of all species, though the creatures he loves are so human they might not be imaginary at all. Dr. Brandon Ayre has been an Emergency Medicine doctor in and around New York and Vermont for 25 years. He has had stories published in Black Heart Magazine, Cartagena Journal, Fjords (‘Barry White’s Fan’ Oct. 2014), and The Medical Post. His Melanie and Myron (The Mice) from Edward’s Animals was one of five winners in an international short story competition. He was also a Finalist (the top 2% out of a 1,000 entries) for two stories in Glimmertrain‘s Very Short Fiction Award in 2012. Before going to med school, he made his living as a singer-songwriter. He’s studied writing at The Vermont Studio Center, The New School, and The New York State Writers’ Institute. He has two children. 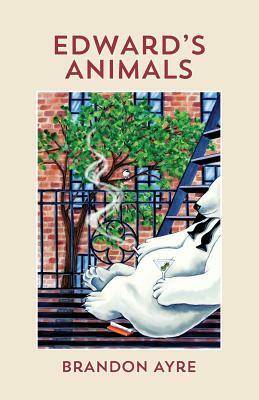 “Edward’s Animals is a sweet, strange, compelling love letter to New York and its unique inhabitants. Brandon writes with a singular wit and grace, his prose confident, intelligent, and direct.”-John Goodrich • Author of Hag and I Do Terrible Things.